Thomas De Gendt (Vacansoleil-DCM) continued what has been an incredible Paris-Nice for the Dutch ProTeam, with an epic solo victory between Sisteron and Nice. The Belgian escaped the lethargic peloton, 48km into the 219.5km stage, with former Estonian champion Rein Taaramäe (Cofidis), and managed to build up a lead that peaked at 12’40” in the mid part of the stage. Contrary to the usual scenario however, with De Gendt and Taaramäe trailing race leader Bradley Wiggins (Team Sky) by 15’44” and 31’07 respectively at the start of the day, the peloton did not bother to chase the two breakaways; instead a battle for the podium ensued between fourth place Alejandro Valverde (Movistar) and Levi Leipheimer (Omega Pharma-Quick Step). With Leipheimer already having crashed twice, and chasing back to the peloton on the final descent of the Col de Vence with four of his teammates, the Movistar team moved to the front to try to stop him coming back. A third crash, as all five Omega Pharma-Quick Step riders came down into a Gendarme’s motorbike that was blocking the outside of a corner, saw the end of the American’s challenge. He remounted, but rolled down the rest of the descent, his race over; Valverde had won the battle and moved up to third overall. Up ahead De Gendt, who had dropped Taaramäe on the climb to the Col de Vence, rode on to take a solo victory on Nice’s iconic Promenade des Anglais; Taaramäe came in 6’18” later, while John Degenkolb (Project 1t4i) led the peloton over after a massive 9’24”. "This morning I thought most of all to save strength for tomorrow,” said De Gendt at the finish. “But I found myself in the right break and once it was gone I realised I was in for a long day. “[On the] Col de Vence, I asked Taaramäe to take his turn and he wouldn’t,” he explained. “It got on my nerves and that’s how I went. The finale was one of the most beautiful I’ve ever seen with such a splendid view. 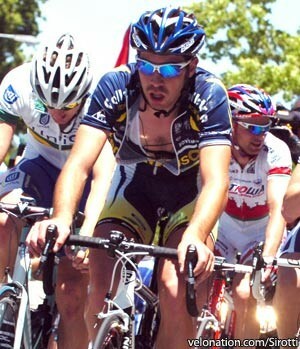 Wiggins was safely in the group, along with second place Westra and - apart from Leipheimer - the rest of the top ten. The British champion still leads Westra by six seconds, and now Valverde by 18, with just the final stage time trial to the top of the Col d'Èze to come. With the hills and mountains of the Centre region now well and truly behind them, the peloton was now faced with the Alpes-de-Haute-Provence and the Alpes-Maritimes before they could dip its toes in the warm waters of the Mediterranean. Contrary to recent usual practice however, the finish on Nice’s iconic Promenade des Anglais would not be the end of things, with the 9.6km time trial to the Col d'Èze awaiting. After several breakaway attempts in the first hour, Taaramäe - who had only recently hit the deck - escaped with De Gendt after 48km. By the time De Gendt led Taaramäe over the top of the 2nd category Col des Lèques after 73.5km, the peloton - led by the Belgian’s Vacansoleil-DCM teammate Frederik Veuchelen in the polka-dot jersey - was 8’25” behind. The 3 points he received for third place gave Veuchelen an unassailable lead in the mountains classification; he now just needed to finish the race to take the jersey. With De Gendt 15’44” behind Wiggins in the overall standings, Team Sky was allowing the Belgian plenty of leeway. Over the top of the 2nd category Col de Luens after 91km, the peloton was 12 minutes back; Evgeni Petrov (Astana) was 1’10” in front of the field at this point, having attacked on the climb. The 3rd category Côte de Peyroules after 99km saw De Gendt and Taaramäe allowed even more time, with their lead now up to 12’40”. The long descent that followed saw Petrov reeled in but, more significantly, Leipheimer crash for the first time. The American came down with Adrian Saez (Euskaltel-Euskadi), but two teammates paced him back to the peloton without too many problems. Through the intermediate sprint at Tourrettes-sur-Loup, after 150km, the two leaders’ advantage was still as high as 11’50”, but surely this would come down as they began the climb to the 1st category Col de Vence a few kilometres later. De Gendt, weary of Taaramäe’s unwillingness - or inability - to contribute any longer attacked and dropped the Estonian. The last time the climb had been used in Paris-Nice it had been used as a springboard to victory by the late Xavier Tondo, and it looked now as De Gendt was about to do the same. Over the top - with 165km down, and 54.5km to go - the Belgian was more than a minute ahead of Taaramäe; Luis Angel Maté (Cofidis) led the peloton over the top a massive 11’35” back. As the peloton hit the descent, a crash saw Levi Leipheimer (Omega Pharma-Quick Step) come down for a second time. Most of the American’s team dropped back to pace him back up again, but the Movistar team was now on the front, trying to get Valverde onto the podium ahead of the next day’s mountain time trial. With 30km to go De Gendt’s lead was 1’45” back to Taaramäe, and still 11’30” to the peloton; Movistar had the bit between its teeth now though, with Leipeimer still struggling to get back on. Inside the final 22km De Gendt was 2’40” clear of Taaramäe; the real battle now though, was between Valverde and Leipheimer; the Movistar-led peloton was now 11’15” behind De Gendt, but Leipheimer and his Omega Pharma-Quick Step teammates were at 12’10”, 55 seconds further back. The American was not only on the verge of losing his podium spot, but at this rate would be lucky to end the day in the top ten. As the descent continued the Movistar and Omega Pharma-Quick Step teams seemed locked together, 55 seconds apart. Leipheimer though, seemed to be having trouble staying with his four teammates as they swept around the winding curves. With De Gendt at 15km to go, the American was just passing the 25km banner, but the Belgian team’s work appeared to be paying off, and the gap had come down to 40 seconds. Suddenly disaster struck the American, as the five members of Omega Pharma-Quick Step all came off on the outside of a corner, hitting a Gendarme’s motorbike as he guarded a sheer drop. Dries Devenyns appeared to be the worst off physically, as directeur sportif Wilfried Peeters tried to work out if his rider had suffered a concussion; Leipheimer’s race was over though, and after a few moments he remounted and rolled gently away with Tony Martin at his side. Despite having despatched its big rival, and having elevated Valverde to the podium for tonight at least, the Movistar team kept the pressure on right to the bottom of the descent. There was no way that the Spanish team was going to catch De Gendt, with the Belgian still 10’50” clear with 10km to go, but they might be able to put another of Valverde’s rivals under pressure on the technical twists and turns. De Gendt meanwhile, was on the flat coastal roads and heading towards Nice. He was beginning to look tired but, providing he could hold off an equally exhausted Taaramäe, some 3’35” behind him, he had the stage in the bag. Sure enough, as De Gendt entered the last five kilometres, his gap to the Estonian was growing and, as Movistar began to relax the pace behind, his gap to the peloton began to open up a little. The Belgian gave a ‘thumbs up’ to the peloton as he cruised along the sunny Promenade de Anglaises, then sat up to take a well-earned solo victory. As the peloton hit the flat coast road, Movistar allowed Team Sky to take over, and the British team line up in front as they rode into Nice. Taaramäe just about managed to stay away, crossing the line some 6’ 17” later, puffing his cheeks and sitting up to enjoy the fact that he was getting the applause of the crowd all to himself. After a long sprint from DE Gent’s Vacansoleil-DCM teammate Romain Feillu, John Degenkolb took the sprint for third some 9’23” later. Leipheimer, along with Omega Pharma-Quick Step teammates Tony Martin, Kevin De Weert, Nikolas Maes - but not Dries Devenyns, who had abandoned - rolled in after 16’50”, losing the American more than seven minutes to his former rivals and dropping him down to 39th overall.